Ageratum Pink Ageratum Mexicanum is a half-hardy annual that can be easily grown from seeds. Another common name of this plant is Floss Flower, and this dwarf variety reaches only 12 inches forming low to the ground mounds of attractive foliage and producing abundant clusters of small, fluffy, pink flowers. 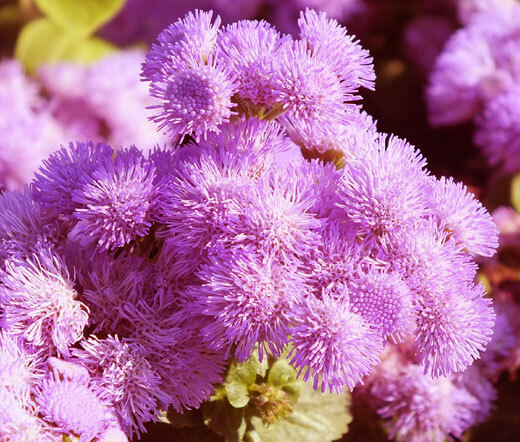 Ageratum has a long bloom period that begins in mid summer and continues until first frost providing delightfully fragrant pink blooms that attract butterflies. Ageratum is good for edging, mass planting, rock gardens, pot and container planting. Ageratum Mexicanum grows best in full sun or partial sun preferring moist, but well-drained soil.